Sprouts are tolerant of almost all soil conditions…except for acidic soils which can encourage club root, a fungus that thrives in acidic soil. 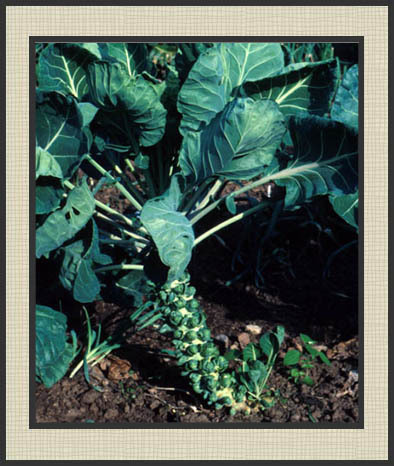 Also, Brussels sprouts are a top heavy crop that would benefit from staking or caging to keep them from falling over in windy weather. They will grow equally well in sun or part shade…but prefer part shade. The key thing when growing Brussels sprouts is to make sure they do not run shy of water. They also have shallow roots, so you’ll want to hand weed if necessary. Unless the soil is poor, you won’t want to fertilize after they start making sprouts, this will cause sprouts to become loose and leafy…also called “blown” sprouts. Brussels sprouts are a long season vegetable. They can take anywhere from 80 to 120 days to reach maturity. So you plant these in spring and harvest in the fall. A hard frost always improves the eating quality of sprouts, and I have read that you’ll want to wait until the first frost to start harvesting. When harvesting, sever the Brussels sprouts from the main stem using a knife – breaking them off will injure the main stem. Take the lowest sprouts first and work up the stem as they ready, the lower sprouts mature earlier than the higher ones. I have also read you can pull them up by the root, just before our Minnesota winter turns ugly and hang them upside down in the basement and continue to harvest from them. I found a site that has a ton of information on growing Brussels sprouts and the bugs and diseases to look out for. Click here to have a look. I have several yummy sounding recipes on file for sprouts that I will post later…but from what I’ve read…the trick to having delicious sprouts that are as far removed from those you were forced to eat as a kid as the east is from the west, is to not overcook them.